We are deeply saddened to pass along the news that Tippy, one of our most precious, little guys passed away on Friday, December 9th. We had only recently completed a video of him enjoying his play time and his death was not expected. He had been declining and getting older, but we were hopeful he would have stayed with us much longer. We loved him so much and were so proud of all his brave efforts. We will all miss him greatly. Tippy's mate, Nadia,was very devoted to him and we wanted to make sure she was taken care of emotionally. We were grateful and fortunate to be able to find her a new mate and hus-bun to care for named Ralph, a special needs SaveABunny adoption alumni. or Checks can be made out to "SaveABunny" and mailed to: P.O. Box 2143, Mill Valley, CA 94942. Both Tippy and Nadia need regular exercise, acupuncture and chiropractic to keep up their strength. Tippy is such a happy and brave little guy that it's simply a joy to watch him run and play with Nadia!! Thank you for caring about Tippy! 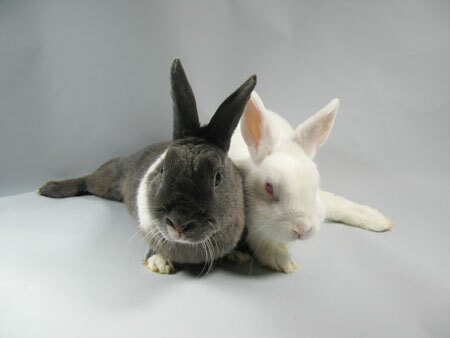 Tippy and Nadia are a bonded pair who are very much in love. They must be adopted together. Nadia, the little, white, spayed bunny girl got her name because she reminded the SaveABunny volunteers of a gymnast, despite her poorly healed, broken leg injury. She's a small graceful, energetic,and curious girl who is fast on her feet! No one knows what happened to her leg,since she arrived at the shelter with a broken leg, but x-rays show that there isn't much to be done but watch her as she gets older for signs of arthritis. Acupuncture and chiropractic treatments are good for her as well as for Tippy as well. Nadia loves Tippy very much and is protective of him! Tippy and Nadia are now a bonded pair and very much in love. They must be adopted together. Tippy is doing pretty well and his movement has improved thanks to chiropractic care and lots of love! Tippy has had a major decline in a very short time and is now having a hard time moving around. to be honest, it is heartbreaking to see such a bright and happy bunny lose his mobility and face such an uncertain future. We took Tipping in for x-rays and chiropractic help, but his prognosis is very guarded. We really need financial help and donations to get him the physical therapy and the extra help he needs to have quality of life. PLEASE DONATE TO HELP TIPPY! Please watch Tippy's video. Click here to make a donation towards Tippy's care Donations are greatly needed and appreciated. Checks can be made out to "SaveABunny" and mailed to: P.O. Box 2143, Mill Valley, CA 94942. Hi! My name is Tippy and I am a very small, slightly "crooked", yet incredibly cute, little neutered boy. As you can see from this photo, my leg sticks out to the side, like a little bunny kickstand. When I was brought into the shelter it was clear that I had experienced some hard times in my short, little life. I was thin, and I have an old, healed fracture on my leg. My ears tips have also been chewed a bit. I'm doing really well now and I know that the rest of my life will be great---especially after I am adopted by someone special like you who will adore me, pamper me and love me. more fragile than your average bunny.